A film-viewing session long anticipated, I cannot help but agree with the many positively impressed critics of the French animated feature, Persepolis. That does, of course, exclude the negative critics that consitute the current Iranian regime. Having won a host of accolades including the Jury Prize at the Cannes Film Festival, Rogers People’s Choice Award for Most Popular International Film at the Vancouver International Film Festival, and Best Foreign Language Film at the São Paulo International Film Festival (2007), it doesn’t come as a surprise that Persepolis has so won over the hearts of viewers since its French release in May 2007. Based on the largely successful comic series of the same name by the Iranian French contemporary graphic novelist Marjane Satrapi, the film is arguably one of the best animated features to have come out this century. 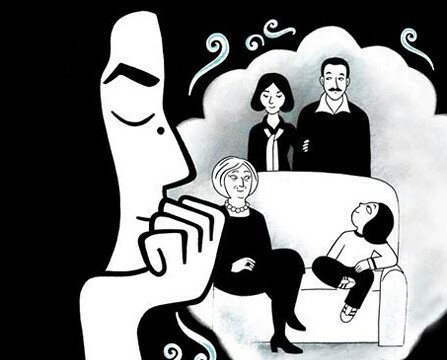 Written and directed by Satrapi alongside Vincent Paronnaud, it relays the autobiographical account of a young girl named Marjane, growing up in a family of the educated elite in Iran under the time of the Shah’s dictatorship and subsequently during the Islamic Revolution. Following her along on her life journey, her various encounters are portrayed during the time of the Iran-Iraq War, after which she leaves for Austria only then to return to Tehran for university and later ultimately winds up in self-imposed exile in France. Satrapi’s own personal upbringing transpired as above: Coming from a progressive family and attending the Lycée Français in Tehran, she left for Vienna at the age of 14 in 1983. Back at university in Tehran, she met a man named Reza, who she married and later divorced. Studying Visual Communication, she was awarded her Master’s Degree from the School of Fine Arts in Tehran Azad University. Her move to France then took her to Strasbourg, eventually meeting the French comics artist David B. (a founder of L’Association) and creating Persepolis and Persepolis 2. She has since won the Angoulême Coup de Cœur Award at the Angoulême International Comics Festival, and Broderies (Embroideries; a later publication) was also nominated for the Angoulême Album of the Year award in 2003, an award which was won by her most recent novel, Poulet aux prunes. The movie’s style is minimalist, black and white with intensely contrasting shaded gradients of gray. Its qualities of illustration, motion and texture can be compared to the 1930’s Betty Boop, with a bit of Powerpuff Girls mixed in with the beautiful French creative sensibility. The story is well-woven throughout, with transitions from various chapters of Satrapi’s life moving effortlessly from one to the other, often very moving and sometimes extremely funny (the scene set to ‘Eye of the Tiger’ is especially memorable). The soundtrack is pleasant, as comfortable as Tiersen’s Amélie score in its medley of Mediterranean strings, expressive brass percussion with hints of ambient and pop from way back when. In addition, the voices were cast extremely well in the French, including Chiara Mastroianni, Catherine Deneuve, Danielle Darrieux and Simon Abkarian. When asked about Persepolis, Satrapi replies saying that she wrote the graphic novels ‘as an answer to the relentless and loaded question of what it means to be Iranian’ (NY Times). The impact such an answer has had is undeniably considerable when her books’ success has meant that Persepolis is taught in 118 colleges in the United States, including West Point, and has been translated into a number of languages. Today, she lives in Paris, continuing her work as an illustrator and author of children’s books, lecturing at academic institutions around the world and guest-contributing to publications such as The New York Times. Interestingly enough, Satrapi finds the movie to provide the better medium, which says a lot about its accessibility in animated format: it really is done very, very well. A rare find for a recent French animated feature, Persepolis continues to run in select cities and will soon be available on DVD.